Elizabeth concentrates her practice primarily on resolving commercial disputes and product liability cases. 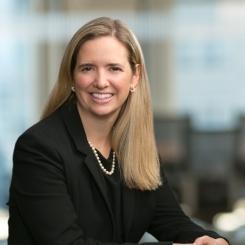 She is a member of Porter Wright’s Product Liability, Healthcare and E-Discovery Practice Groups. At the end of my summer clerkship at Porter Wright, I was unsure whether I was ready to choose a department. A Porter Wright attorney asked me if I could envision my legal career without writing briefs, examining witnesses or appearing before the court. My answer was, “no,” and I knew then that litigation was the right choice for me. What is the best advice you’ve received about how to be a successful attorney? Be yourself. Trying to be like someone else will not help you be the best advocate for your client. My favorite thing to do outside of work is to experience something new with my children. I love to see their faces light up when they achieve a new goal, even when it is something small like zipping her own jacket for the first time, which my three-year-old daughter recently mastered. Teacher. I had great teachers who helped me learn and grow into the person I am today. I would love to make that type of impact on students.